In 1905, a move of God rocked Alvin, Texas. It began when some local couples traveled to Kansas because they heard the baptism in the Holy Spirit was available there in Charles Parham’s meetings. They came home from these trips and prayed God would send Parham to Alvin. Charles Parham and William J. Seymour were two central figures in the development and early spread of Pentecostalism. Parham opened a Bible school in Houston. In 1905, he and a group of students traveled by train to Angleton to hold some meetings. They had a layover in Alvin where they went onto the streets and ministered to the townsfolk. They were invited to return and were offered use of the opera house for Gospel meetings. Parham’s students conducted these meetings and, when attendance got too big for the opera house, they moved the meetings to a warehouse on the corner of Gordon and Sidnor. The photo shows a long line of people standing outside the warehouse waiting to get inside a meeting. People came from all around and God did many healing miracles. Some were “slain in the Spirit,” sometimes unresponsive for hours. The newspaper told of bodies being stacked on carts like cord wood and rolled over to the depot to be put on their train for the trip home. Alvin became one of the first established revival centers in Texas. Parham made four trips to Alvin and his final visit in 1916 brought one of the Great Revivals of all time. A healing room ministry provides a place outside the church setting where volunteers pray for people in a private and safe environment. John G. Lake opened a healing room ministry in Spokane in the early 20th century. There were over 10,000 documented healings in the short time it operated there. In 2000, Cal Pierce re-opened a healing room in Spokane. Since that day, they’ve spread across the US and around the world. Whether in a beautiful building or a thatched hut, healing rooms volunteers invite the Presence of God, asking Him to minister healing and deliverance to the people who come seeking freedom. And He does it time and time again. A comprehensive collection of data on historical revivals, miracle healing testimonies, biographies of healing evangelists, and links to additional sources for further study. 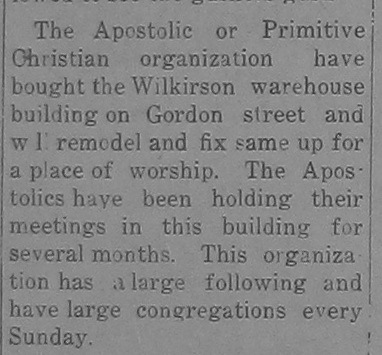 An early 1900's reference in the Alvin newspaper about the remodeling of the warehouse that housed the large healing revival meetings. "Let all that I am praise the LORD; may I never forget the good things he does for me. He forgives all my sins and heals all my diseases. He redeems me from death and crowns me with love and tender mercies. He fills my life with good things. My youth is renewed like the eagle’s!"